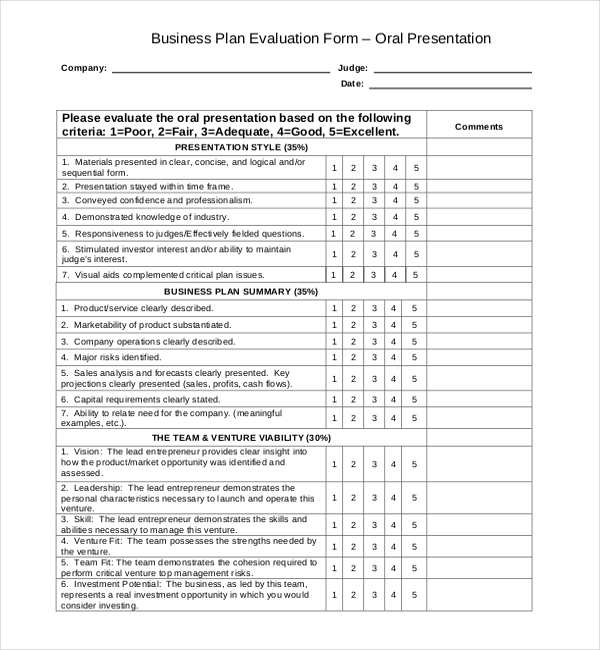 This form is used to evaluate the oral presentation. The audience has to explain whether the materials presented were clear, logical or sequential. The form is also used to explain whether the time frame of the presentation was appropriate. They have to evaluate whether the presentation conveyed professionalism and demonstrated knowledge of the industry. This form is used to explain whether the introduction was capturing their interest. They have to further explain whether the purpose of the presentation clear and logical. They have to explain whether the presentation resulted in a clear conclusion. They have to explain whether the speakers were natural and clear and whether they made eye contact. This form is used by audience of the presentation to explain whether the purpose was communicated clearly. They have to further explain whether it was well organized and the presenter had understanding of the topic. The form is used to explain whether the presenter was well-prepared and spoke clearly. 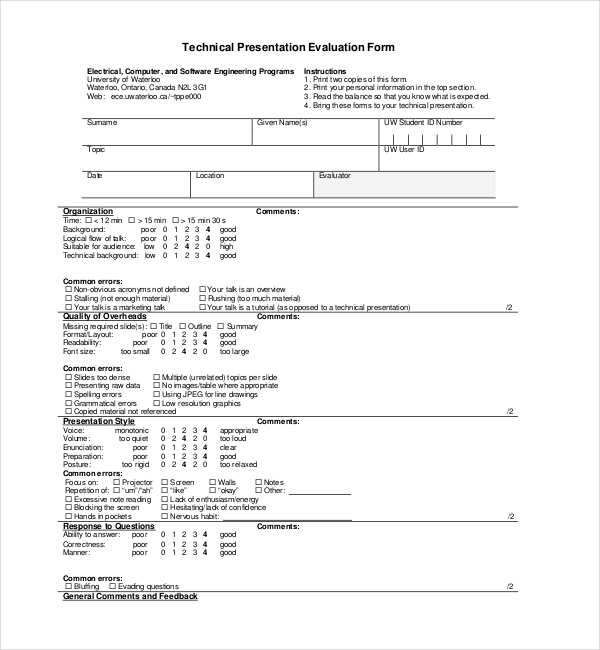 This form is used to evaluate the presentation and circling the suitable rating level. One can also use the provided space to include comments that support ratings. The aim of evaluating the presentation is to know strengths and find areas of required improvement. 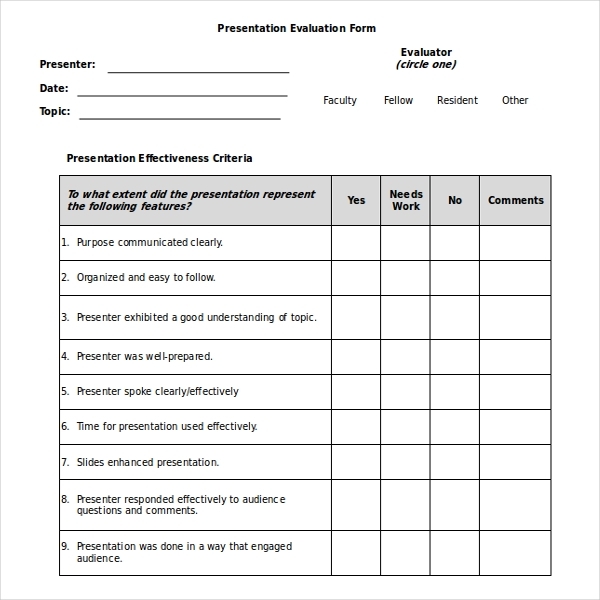 This form is used by students for evaluating other student’s presentation that follow a technical format. It is criteria based form which has points assigned for several criteria. 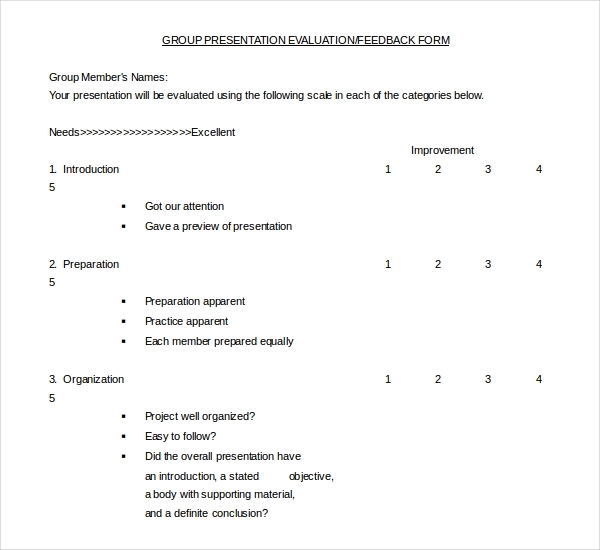 This form is used by students to grade the contributions of all other members of their group who participated in a project. It is vital to evaluate a presentation prior to presenting it to the audience out there. Therefore, the best thing to do after one is done making the presentation is to contact review team in the organization. He/she should have the presentation reviewed prior to the actual presentation day. 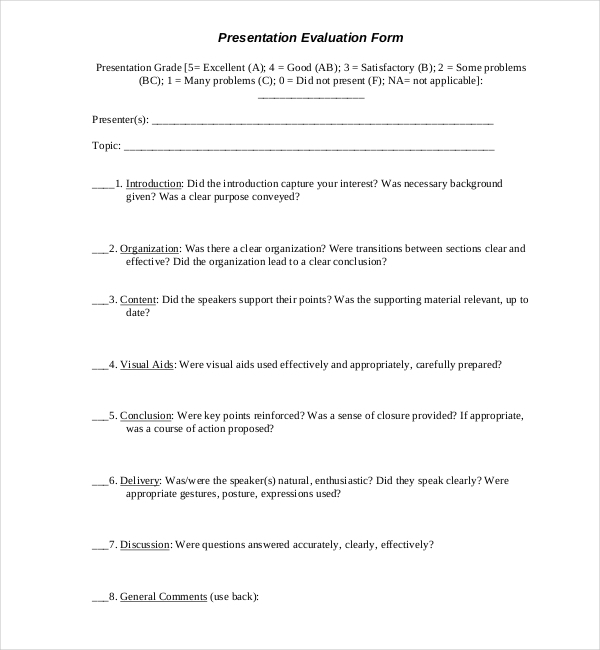 There is sample of presentation skills Evaluation forms that one can use to conduct the evaluation. They can finally end up with the proper data as necessary. As opposed to creating a form from scratch, one can simply browse through the templates accessible. They have to explain whether the time and slides effectively used. 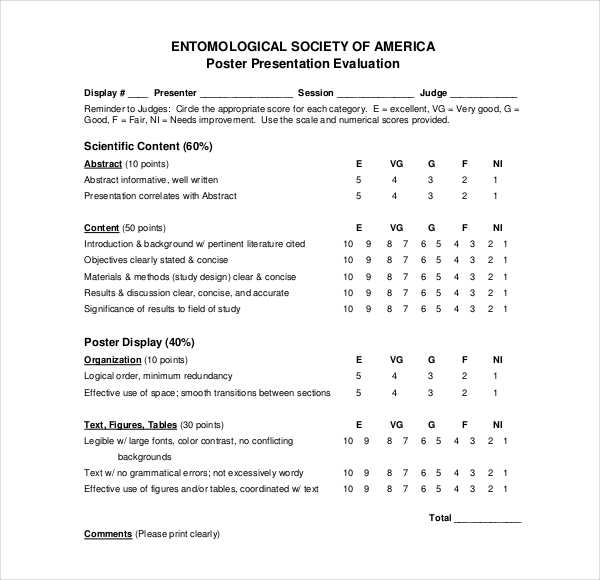 This form is used to explain the best parts and worst parts of the presentation. The user has to explain whether the presenter described the healthy housing and action steps. They have to explain whether the presenter has missed any points and the ways presenter can improve. This form is used to explain whether the presenter created a setting for positive learning experience and the way they did. They have to further explain the way the presenter encouraged participation. They have to rate the trainer’s presentation style, knowledge, eye contact, voice and hand gestures. 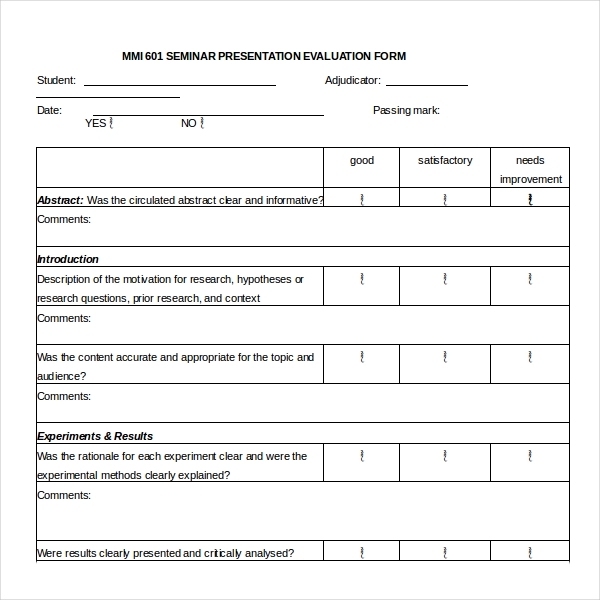 This form is used to give constructive feedback to the students who are presenting any of their seminars. The evaluation results will be used to enhance the effectiveness of the speaker. The speaker will discuss the evaluations with the graduate student’s adviser. This form can be used to add comments. 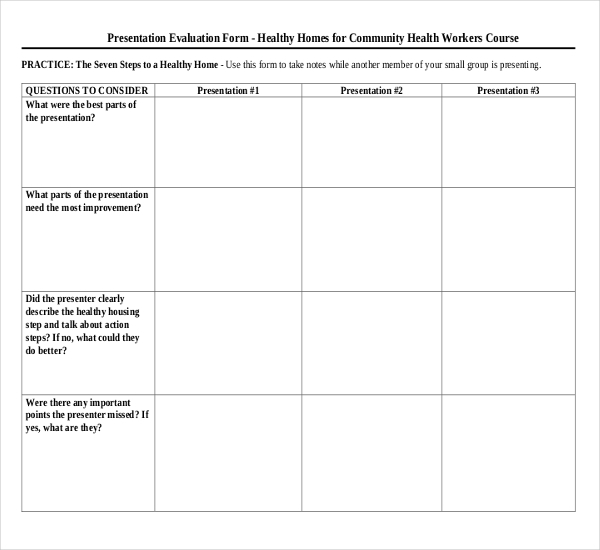 This form is used by anyone who is providing a teaching presentation. This form is for use of the audience. 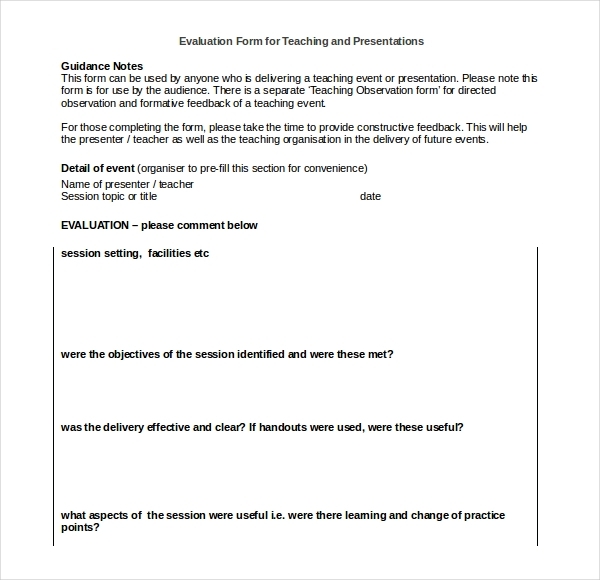 There is a different Teaching Observation assessment for formative feedback and direct observation of a teaching event. They are asked to provide constructive feedback to help the presenter and the teaching organization in future events. This form involves inspection of the poster with the evaluation of the content and visual presentation. It is also used to discuss the plan to present poster to a reviewer. The questions asked in this process, needs to be anticipated by them. They also add comments, if necessary. This form is used to explain whether the introduction, preparation, content, objectives and presentation style was appropriate. It is also used to explain whether it was visually appealing, the project was well presented and the conclusion ended with a summary. One is also asked to explain whether the team was well connected with each other. One can also add overall rating of the project and add comments and grade. 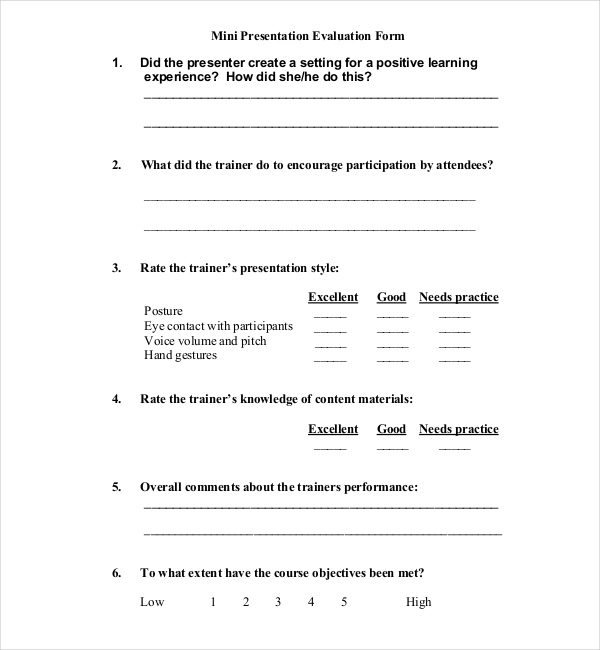 Presentation evaluation form is used by the audience to explain whether the presenters effectively fielded questions and stimulated investor interest to maintain judge’s interest. They have to further explain whether company operations, the product or service was clearly described. This form is also used to evaluate whether the major risks, capital requirement and projections (sales, profits, cash flows) clearly presented. These forms are for anyone who like to give and get feedback for their work or anyone who like to show or watch presentations in educational or business event. 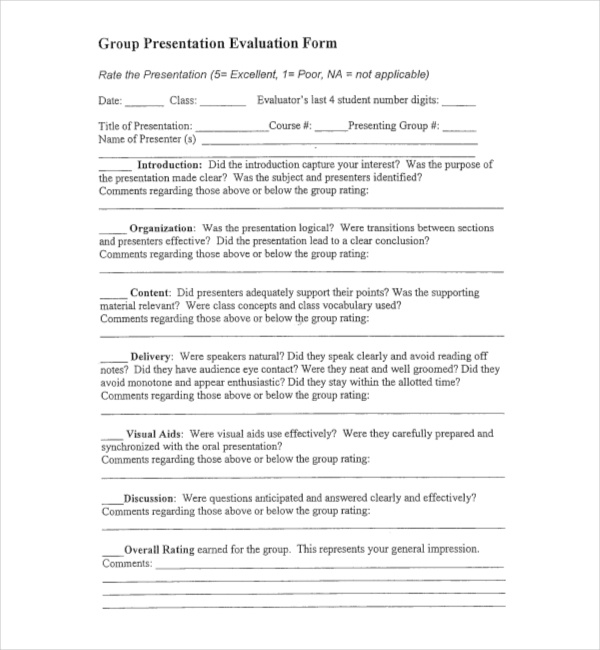 This form helps determine the goals and objectives of a presentation in a crowd which will help determine which techniques to use. The presenter might learn the process of defining goals in the presentation and choose a technique in future that will most effectively meet them. These forms are for the educators and students who work in small, motivated and energized groups to learn the subjects thoroughly and complete complex tasks. It is also targeted on those who explain, analyze, summarize, and evaluate the subject or topics in a group. And also those who plan, organize, summarize main points and solve problems of reading. Presenter might learn to create understanding about the topic, demonstrate confidence, convince and move the audience to action. They might also learn to organize the information in a coherent manner, develop an effective thesis for an oral presentation, and practice the use of emotional and logical appeal to persuade an audience. They might learn to practice the use of their voice, gesture and body movements to convey meaning. They might understand the significance of transitions in adding coherence to a speech. They might prepare an effective introduction and conclusion in their future presentations. They can also create an effective and useful speaking note and outline. They will develop confidence and experience in their presentation skills by becoming a local expert in the subject. 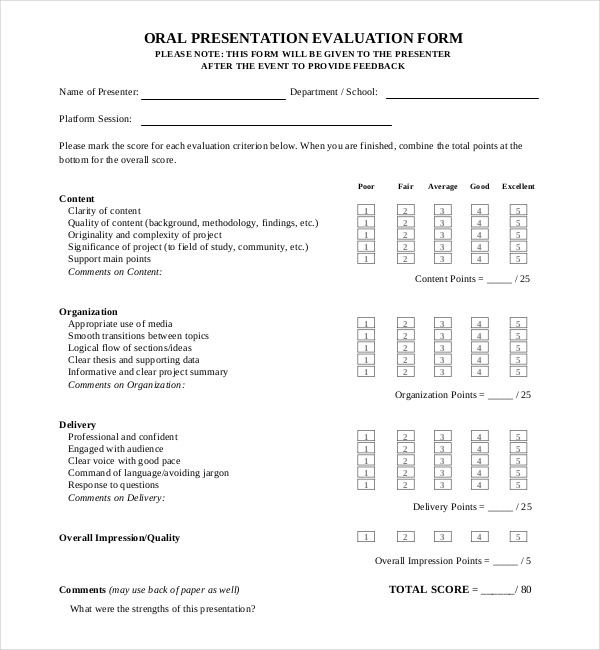 The presentation evaluation form helps presenters to gain feedback and confidence for speaking and presenting in future event in front of a large group. The presenters learn to take personal responsibility for critically learning and responding to questions. In this process, presenters might become localized experts on certain subjects.